Our bakers make some of the most unique breads in the state. Our “from scratch” breads are designed to taste like homemade. Try the Buttermilk, Pilgrim or Onion Rye breads! The sweet side is always nice…homemade cookies, coffee cakes, granola, and from scratch pies (no canned filling). Stonehouse Breads from Traverse City…European style breads from their German ovens. Laughing Tree Breads from about 8 miles east of here using their homemade wood fired stone oven. Their breads are dense and delicious. The Bakery on the Corner in Hart makes all of our sweet rolls and some of our breads. Our cake decorators have a combined experience of over 40 years. 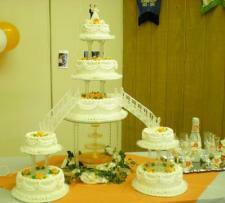 They can do whatever you need in a cake from a simple birthday cake to an extravagant wedding cake. Our new computerized picture printer can put any picture you want on a cake. Click here to view our homemade cakes web page - includes pictures of some of the previous cakes we have done.